The first step in planning your event is to make a room reservation with our main office. Call (269) 327-5500. The rental fee of $495.00 is required to confirm and hold your given date. 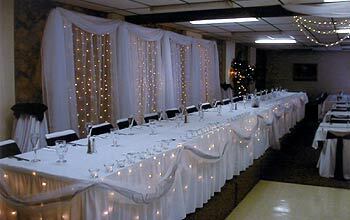 This fee includes our staff sets-up and cleans-up the banquet center. Details concerning the estimated number of guests, special table arrangements, and head table requirements may be given at this time. In order to book your date, estimate your attendance closely and plan your menu with as much notice as possible. Generally, seating will be at eight-foot banquet tables that seat eight guests each. Other arrangements may be made to accommodate larger-sized groups or special requests. Your menu requirements should be discussed with Daane's catering and finalized at least six weeks in advance. If this is not the case some selections cannot be guaranteed. To review your special needs, schedule a serving time and to discuss any other special requirements please call our main office to schedule an appointment. All appointments will be held at our Portage Road office unless otherwise specified. Menu prices do not include fees for special services, rentals, or other specialty items. Complete catering services for receptions, teas, office retirements, buffet meals, etc. are available to off-premise groups. 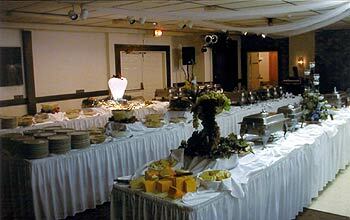 Off-premise catering includes disposable dishes, silverware, napkins, and table covers. Typically, the client may provide decorations. NO masking tape, scotch tape, nails, tacks, etc. are to be used on any painted, wall papered or veneered surface. Arrangements regarding decorations need to be coordinated in advance. All balloons must be inflated before delivery to the hall. All candles must be in enclosed containers. 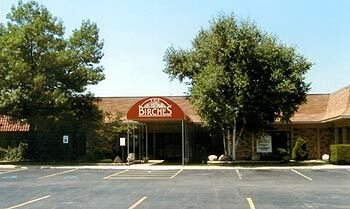 No food or beverage may be brought into The Birches. It is against Michigan State Health Department regulations to remove leftover food from The Birches or any off-premise-catering event that we work. Payment is due 72 hours (3 days) prior to your event. This payment is to be made at our Portage Road office. This is also a good time to bring your decorations in. 6% Michigan State Sales Tax and a 17% service fee will be added to the total invoice. We reserve the right to charge for damages or missing equipment and furnishings. All lunch and dinner buffets are served on china with real silverware. Tablecloths are provided for meal functions. Linen tablecloths and napkins may be rented. Disposable cake plates and forks are 35 cents per person. Daane's Catering must be notified NO LATER than 5 working days in advance of your party of your final guaranteed guest count. We will prepare food and set the room for 5% above this guaranteed count up to a maximum of 15 guests. You will be billed on the final guaranteed count or the number of actual meals served whichever is higher. To insure a pleasant dining experience, it is essential to be accurate on your final guaranteed count. Available with Standard or Premium Brands. Champagne Punch, Whiskey Sour Punch, Margarita Punch, Pi�a Colada Punch, Screwdriver Punch. Pre-Mixed Punch, Beer, Pop, and Non-Alcoholc Punch with Cash Bar. Beer, Wine, Pop, and Non-Alcoholc Punch with Cash Bar. Beer, Pop, and Non-Alcoholc Punch with Cash Bar. Non-Alcoholic Punch OR Pop with Cash Bar. Non-Alcoholic Punch AND Pop with Cash Bar. Cash Bar (May be paid by either the host or the guests). Available with Standard or Premium Brands. Bar Set-ups are extra: Mixes, Ice, Glasses, Stirrers, Fruits, etc. Bartender fees are included in the prices for options A thru G. Bartenders will be added per hour for options H and I. Bartender's charges begin one hour before the party for set-up and end one hour after the party for clean up. One bartender is required for every 25 to 100 guests. Champagne Toast, Non-alcoholic Champagne Toast, Combination Champagne and Non-Alcoholic Champagne Toast, and Coffee and Tea Service are available. The bar may be closed during meals if desired by the host. All options are for the entire party and cannot be combined during the event. Minimum 4 Hours. Bands and DJ's must finish one-half hour after the bar is closed. First hour drinks priced at less than 2 drinks per person & each additional hour at less than 1 drink. 6% Michigan States Sales Tax & 17% Service fee will be applied to all orders.